Madrid Atocha train station has been the central downtown railway station since the begining of train services in Madrid. Located a stones throw from the famous Art triangle, Retiro park and some of the more exclusive hotels in Madrid its positioning allows travellers to start exploring the city the moment they touch the platform and are greeted by the impossing 19th century glass span station roof. For the visitor to Madrid wishing to travel onwards to other towns and cities throughout Spain Atocha is certainly the easiest interchange to get to via its Metro and Cercanias interchange as well as being the terminus for a number of city bus routes. If however you take a taxi to or from the station be aware that you will have to pay a small supplement to the milage fare. Until the 2009 opening of a connecting tunnel under the center of Madrid Atocha only served select destinations with travellers being forced to connect through the city to the Northern Madrid train station of Chamartin. Now however those trains that depart from Atocha pass through Chamartin and vice versa. In the case that your journey is on one of the few trains that still departs from one or other of the stations the Cercanias offers connections between Chamartin and Atocha every 3 to 4 minutes. With services "divided" between the Northern Madrid terminus of Chamartin and central Madrid Atocha it can be broadly stated that the network from Atocha covers departures to the North East, Central and Southern Spain. As said earlier some additional trains to the North West and West of Spain now terminate at Atocha as well. Due to modernization and expansion of the Spanish railway system in the 20th century the old station building at Atocha couldn't offer sufficient capacity for the new services and in front of the old building a new series of platforms were constructed. 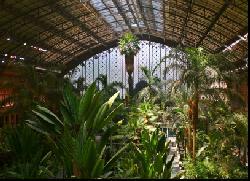 Thankfully instead of building on top of what is a landmark in itself the original station was converted into an enormous foyer containing the ticketing offices, travel agencies, restaurants and the piece de resistance a tropical garden! Further expansion and connection to the Metro and Cercanias systems saw development of an adjacent series of platforms both under and overground. If transferring between the different types of trains allow 10 minutes to do so, not so much for the distance but for the security checks and ticket barriers. All these developments have left the train station with a "one level" layout with only the interchange with buses and taxis requiring the traveller to change floor levels to what is effectively the roof over the newer platforms. The roof structure is at street level and it is here in front of the quasi Roman style Ministry of Agriculture that the memorial to victims of the 11-M (March) train bombing is located. The circular glass tower is unmissable and the scene of rememberence services each year. Rather than eat inside the station and nothing more than having walked out of the station there are a series of cheap andwholesome restaurants / cafeterias serving everything from bocadillos (sub style sandwiches) to full three course meals. The Menu del diain these places is around 12€ per person for a two course meal with dessert and wine or water. For those who need something quicker there is also a McDonalds. If travelling on one of the High speed Ave trains arrive at least 15 minutes before as airport style security sees queues forming at popular travel times. Whilst the Metro is an option for travelling to Barajas airport from Atocha there is also a faster connecting bus service which departs at 20 minute intervals from a dedicated stop outside the station. Both options cost the same with the bus being slightly faster at approximately 30 minutes whereas the metro will take you 45 to 60 minutes depending on connections. Our recomendation is take the 24hr Madrid airport Atocha bus if travelling outside the following hours: 0800 & 1000 then again between 1700 & 1900.